How loyal is Zimbabwe's army?How loyal is Zimbabwe's army? was a saboteur and a security risk to Zimbabwe. and extremely difficult for Zimbabwean journalists to work. paper's management. The list of restrictions goes on and on for 44 pages. jail and we all looked at each other and the mood became more sombre. areas of the bill that leave a great deal to the discretion of the minister. are scheduled for March 9-10.
journalists, since we are not entitled to apply for the government licence. T-shirts which say "I defy the access to information bill". farmers and the thousands of workers who depend on them for a livelihood. monitors from overseeing the elections. to assist the Kabila regime in Kinshasa. action. But what a pathetic body the Commonwealth has proved itself. of good governance that it has sworn to promote. another African leader about dumping whites off their land. President Sam Nujoma who lapped it up. Africa refuses to play along. been talk in Johannesburg of speculators undermining the currency. Perhaps. hearing the hollow laughter of his oppressed fellow Africans. independent poll monitors and give the government sweeping security powers. international observers and media at its presidential election in March. over the country's human rights record. President Robert Mugabe is trying to tighten an authoritarian grip on power. government of President Robert Mugabe, who has been in power 22 years. This came one day after Zimbabwe's defense forces commander Gen.
back political leaders who fought in the liberation wars against white rule. representing Guy Watson Smith, a Mashonaland East Farmer. them. They were not prepared to listen to reason or dialogue with us." as legal counsel for Watson-Smith. received December salaries from the new management." offices of the Deputy Sheriff. Mujuru replied, "Zhou has told me that he will pay from the 9th November". evidence of receipt of the money by staff." Said Watson Smith. senior member of the ruling Zanu PF politburo and central committee. of the ruling party, Robert Mugabe if they want to avoid untold suffering. is not to be considered a pointless exercise. not write stories that "invite security organizations to be involved". makes laws that deal with all aspects of the country's governance. controlling the paper" as "either malicious or ignorant or both". legislation in Robert Mugabe's 22-year reign. designed to curb freedom of the press. of the separation of powers." stand Zimbabwe's values and laws were free to leave the country." Zimbabwe's presidential election campaign kicked off yesterday as Robert Mugabe's Zanu-PF party used its parliamentary majority to pass two controversial bills designed to stifle dissent. The general laws amendment bill bans independent election monitors and denies voting rights to millions of citizens abroad. The public order and security bill criminalises criticism of Mr Mugabe and gives the government sweeping new security powers. Both were passed by a majority of 62 votes to 49. The opposition Movement for Democratic Change immediately announced a legal challenge. The MDC foreign affairs secretary, Tendai Biti, said: "We are going to challenge this package of fascist rules in the courts. They are trying to clothe fascism with this whole set of bills." The laws are the first step in an election campaign which Mr Mugabe will portray as a "war" between true black liberation and an opposition under the control of white farmers and British neo-colonialism. The MDC, which is widely tipped to win the vote in the unlikely event of the election being free and fair, derided Mr Mugabe for using land and race issues as a cover for a violent campaign to terrorise voters and rig the outcome. Morgan Tsvangirai, the MDC presidential candidate who Mr Mugabe said last month would "never, ever" come to power, called on voters yesterday not to be swayed by intimidation. "Zimbabweans are under siege," he said. "The government is creating a climate of terror and hardship. I call upon all patriots to refuse to be cowed into submission by tyranny and a dictator whose time has come. "Those draconian measures being imposed by the present regime would not be necessary if they believed they had the confidence and the support of the people of Zimbabwe." The election on March 9 and 10 is the culmination of a two-year strategy by Mr Mugabe to cling to power in the face of rising unpopularity. It began with the seizure of white farms but has evolved into a broad and violent campaign against the opposition. The MDC says the assault has killed 88 of its supporters and driven its campaign largely underground. It has ruled out election rallies in many areas for fear of violence. Unfortunately for the opposition, Mr Mugabe has been been warned twice about the true strength of feeling against his government. In the past year he has lost a referendum on constitutional reform and Zanu-PF achieved only a narrow victory in the parliamentary elections despite widespread intimidation. But the two ballots gave the government notice that extraordinary measures would be required if it was to hang on to power. It has sought to manipulate the law to keep the opposition at bay. Zanu-PF has revived its youth brigade as a paramilitary force which is being deployed in towns, at times sealing off whole areas in "recruitment drives", while the self-styled war veterans who led the occupation of white-owned farms intimidate rural voters. At least five opposition supporters have been murdered in the past month, and the MDC expects the violence to grow. The army and police have been moulded into highly partisan forces in the past year. The police routinely refuse to stop violence against the opposition. While government supporters act with impunity, Mr Mugabe uses the law against his opponents. Since the September 11 attacks in the US, he has taken to calling his opponents and journalists "terrorists" and said they would be dealt with as such. Eddie Cross, the MDC economic spokesman, said the campaign would be difficult. "We are in for a tough electoral battle," he said. "Zanu has already declared war. They have deployed their troops, many in uniform paid by the state, and are prepared to do anything to win". Last week Mr Mugabe tried to shore up support by redistributing formerly white-owned farmland to more than 1,000 families. The move was part of his strategy to try to keep attention on the issues of land and race. One Zanu-PF election advertisement portrays Mr Mugabe as an African nationalist confronting an opposition stooge for whites and the British. But many ordinary Zimbabweans are more preoccupied with the consequences of Mr Mugabe's policies, which have resulted in surging unemployment, nearly 100% inflation and shortages of food staples such as maize. The military hierarchy has added to the climate of intimidation by warning that it will not serve a president who does not "support the objectives of the liberation struggle". That has been widely interpreted in Zimbabwe either as a thinly veiled threat to refuse to recognise an opposition election victory or a warning to Mr Tsvangirai is he does take power not to interfere with the military. There has been talk of putting senior officers on trial for corruption and for the role of some of them in the Matabeleland massacres 20 years ago. The MDC responded by accusing the armed forces commander, Vitalis Zvinavashe, of treason and a "pre-emptive military coup". But there are reasons to doubt that the bulk of the army would back a coup. Most soldiers are too young to be wedded to the liberation struggle, their families are suffering the same economic deprivation as many others, and there is unhappiness at Zimbabwe's role in the war in the Democratic Republic of Congo. Mr Mugabe promised to double the police and military pay. He tried the same tactic with a 60% pay increase before the constitutional referendum. That did not stop soldiers voting overwhelming against him on that occasion. comrades-in-arms.Others took no notice at all. were, chose to do absolutely nothing about it. most probably have been averted altogether. distance from the polling booths. liberties or a Bill of Rights to talk about in this country. lives were lost in pursuit of Zimbabwe's hard-worn independence". We dismiss that with the contempt it deserves. is expected to observe the objectives of the liberation struggle. different agenda that threatens the very existence of of our sovereignty . defeat for Mugabe at the coming presidential election. inviting the army to seize power. going to vote in our millions according to our political conviction. State as all power now rests with the generals. Laws Amendment Bills in Parliament yesterday. amendments, brought in through the General Laws Amendment Bill. being denied the right to do so by Zanu PF. of the House, steered the Bill through. all authority being vested into the Electoral Supervisory Commission (ESC). prevent millions of Zimbabweans in the diaspora from casting postal votes. mobilise workers to protest against what it described as “acts of treason”. liberation war credentials to rule the country. say the statement was meant to frighten the people from voting freely. guerrillas.” The MDC said Zanu PF could never suppress the people’s wishes. 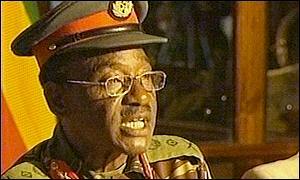 liberation war history,” Jongwe said. of telling voters who should lead them. reserve my comment,” he said. How loyal is Zimbabwe's army? President Robert Mugabe came to power following a long and bitter guerrilla war, and 22 years later he is relying on the military to keep the keys to State House and power. The commander of Zimbabwe's defence forces, General Vitalis Zvinavashe, said on Wednesday that the military will only obey a political leader who participated in the 1970s war of independence. "We will... not accept, let alone support or salute, anyone with a different agenda," he said, flanked by the commanders of the army, air force, prisons and the much-feared Central Intelligence Organisation chief, all former comrades-in-arms of Mr Mugabe. The statement was significant because Mr Mugabe's main challenger in March's presidential election is Morgan Tsvangirai, a trade-union leader with broad political support, especially among urban Zimbabweans, but a man who used his free time when younger to further his studies rather than join the liberation movements. But while the military top brass are Mugabe loyalists, he cannot necessarily count on the support of the rank-and-file. The Zimbabwe National Army was formed at independence in 1980 by fusing the army of white-ruled Rhodesia with the two liberation movements - Joshua Nkomo's Zipra and Robert Mugabe's Zanla. Mr Mugabe's policy of awarding the best jobs in the new army to favoured Zanla personnel meant that discontent has always simmered among former members of Zipra and the former-Rhodesian army. Before a proper integration process had even begun, Mr Nkomo's troops rebelled and marched on Bulawayo, Zimbabwe's second largest city, in an attempted coup. Luckily, a few hundred black and white former Rhodesian soldiers stood in their way and, together with the air force, managed to defeat the 5,000-strong rebellion and prevent the new state from plunging into open civil war. Unsure of his grip on power, Mr Mugabe privately commissioned the creation of the North Korean-trained Fifth Brigade, under the command of Perence Shiri. In the early 1980s, they became notorious for their cruelty when they were deployed in the largely ethnic Ndebele areas of the country, to put down a suspected Ndebele and Zipra insurrection against Mr Mugabe. Within two years these "political warriors" had laid bare an area representing one-third of the country with scorched-earth policies, where thousands were killed, crops destroyed and homesteads burned. More recently, as living standards have plummeted, urban areas have erupted into occasional bouts of anti-government violence. 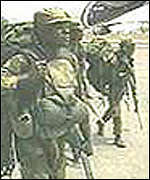 The army has been used on several occasions to stamp out the unrest and has been accused of using excessive force. In 1998, the army was sent to the Democratic Republic of Congo in support of Mr Mugabe's close ally, the then President Laurent Kabila. In the DR Congo, the graft, corruption, mismanagement and ill-discipline among Zimbabwe's soldiers was exposed by their involvement in diamond deals and lucrative joint ventures. There have also been many reported discipline problems among the soldiers, with secret court-martials for those unhappy at being sent to the DR Congo. Since 1993, pay and living arrangements have deteriorated, with up to 40% of personnel having to live outside barracks because of a lack of proper accommodation and funds to feed them. Pay of all security forces was doubled from the start of this year, though some soldiers may see through this attempt to buy their loyalty ahead of elections. If the military commanders did order their troops to move against a political leader who they did not approve of, many of those soldiers without decent accommodation, or who still bear a grudge from the divisions of the war of independence, would be reluctant to obey. Equally, if Mr Mugabe tried to rig the election results, this would quite likely lead to widespread unrest in the urban areas, where support for his opponent, Mr Tsvangirai is overwhelming. Mr Mugabe would be wise not to rely too heavily on the army to keep him in power if Zimbabwe's voters want him to go. I have the strength and confidence to help secure change. their manipulation, suppression and repression of the people. If not by men, then by God. No evil lasts forever. been sown in the soul of the motherland. pretentious claims of black emancipation. The Zanu PF political hyenas will not stay in sheep's clothing forever. After all, Mugabe is not superhuman. his downfall is just around the corner. that I will not leave Zimbabwe. to the ancestors, the newly born and all the future generations. breaks loose because Zimbabwe is the only home I have. will I make a conscious decision to go and survey the world. they are destined to live and lead the people forever. but they will not destroy the spirit of the people. I will not leave Zimbabwe because I believe in the power of the people. nation under lock and key. We will fight until we are freed of the strife that is surrounding us. They can kill my body, but they will not destroy my spirit. My spirit will stay here. It will find space in new hearts. into the hearts of the people. are doing a great disservice to the future generations. us like a septic tank. God and His people - and not Zanu PF - will have the last say and laugh too. and to know will not be surfeited by old, haggard power-mongers. The people's power is divine, and shall conquer. God will not tolerate this "organised disorder" for much longer. lose if it does not come to grips with the situation in Zimbabwe. "If SA ducks the challenge on Zimbabwe, there will enormous costs," he said. "Knowing how deeply the SA president cares about the African renaissance,"
us and has to be protected." elections are a farce, if one cannot have observers," Crocker said. important foreign policy challenge SA faced. damage to (it)", he said in an interview. activities, promotes research into mediation of conflicts. "Engagement is not an act of charity it is to pursue interests and choice,"
diplomacy" or strident criticism as a great deal could be done in private. pile pressure on and offer incentives to Harare to change its ways. express interest and concern" about the situation. This, he said, would signal that "the free ride" for Mugabe was over. evict a local war veterans leader from the farm. Ndanga General Hospital. He had been living in the farmhouse. treating Maseva for multi-fractural injuries. have asked to compile a report on the attack," said Mhlanga. property despite the fact the farm was listed. allowed to occupy more before land-hungry people. police burning down the structures the settlers had built. will severely restrict press freedoms ahead of a presidential election. by parliament and signed into law. bill to a vote in parliament, where it has a voting majority, on Tuesday. to his power since leading the country to independence from Britain in 1980.
the Federation of African Media Women-Zimbabwe said in a joint statement. government, including laws that criminalise criticism of Mugabe. election monitors and deny voting rights to millions of Zimbabweans abroad. with powers to license, investigate and restrict journalists in Zimbabwe. Several journalists have been expelled from the country. Mugabe in the March poll. for Democratic Change is somehow a threat to national sovereignty. abuse of power, ignoring a democratically expressed need for reform. growing tone of desperation in government statements. opposition is being bludgeoned by Zanu PF thugs with impunity. more time in Brussels today. subsequently blocked a court-ordered police investigation into that crime. trusted to honour a democratic outcome in the March poll. military leaders to instruct them. revolution it long ago betrayed. presidential election is won by a candidate other than President Mugabe. Democratic Change candidate Morgan Tsvangirai. candidate who holds “values” different to theirs. destiny and the defence forces should be subject to the will of the people. “Those threats are clearly outrageous and unconstitutional,” Madhuku said. The ZCTU said Zvinavashe’s remarks were “treasonous and careless”. after a politburo meeting on Wednesday. suggested it was in their interests to do so. “We see this as protection fees,” one executive said. accusations are nothing but lies,” another executive said. donated $15 million to the MDC”. shareholders where the money went. increase because of the disturbances. pay the school fees," the union said. leading to the March presidential elections. bishops' conference said in an early January statement. it won independence from Britain in 1980.
replace it with dialogue," the bishops' statement said. Zimbabwe is heading for international isolation after parliament passed laws giving President Robert Mugabe dictatorial powers. Both the EU and the US have threatened President Mugabe with sanctions if he continues to dismantle democracy within Zimbabwe. New Zealand has demanded Zimbabwe be expelled from the Commonwealth. A high-powered Zimbabwe delegation is expected to be given a rough ride at a meeting with EU officials in Brussels. Foreign Secretary Jack Straw seems certain to carry out his threat to demand Zimbabwe's suspension from the 54-member Commonwealth. South Africa says it is "unacceptable" for Zimbabwe's army chiefs to say they would only accept a Mugabe presidential election victory. Critics say the two controversial laws are designed to stifle dissent ahead of the presidential election on March 9-10. New Zealand foreign minister Phil Goff said the legislation further restricts the rights and freedom of the press and clearly shows that the election will not be free or fair. The case against allowing Zimbabwe to remain in the Commonwealth "is overwhelming", Mr Goff said. "There is documented evidence of harassment, arbitrary arrests, assaults, torture and killing of those who oppose the regime," he added.